RC Fishing World introduced the “Radio Ranger” rc fishing boat last fall. This is a very popular choice, and we can see. One look at it and you’re impressed by the size, it’s almost 3 feet long! Next are the great graphics that are all over the boat. Once we inspect the boat as a whole, only then do we see the design is what makes this r/c boat a winner. With the big twin motors this thing is fast too! The kids will have a blast if they can get it away from adults! 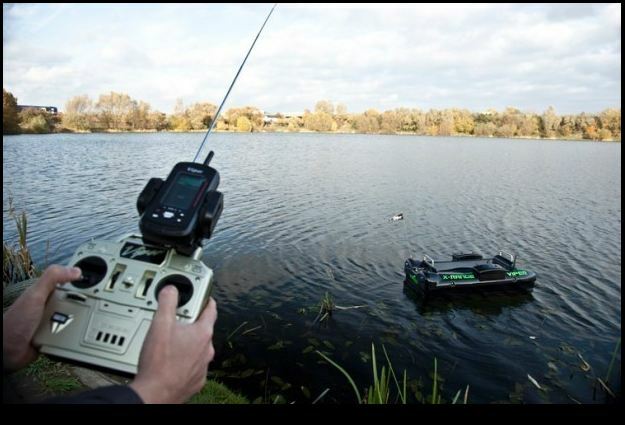 It’s a cool lookin remote control boat, but with “The RC Fishing Pole” it’s a R/C Fishing Boat! It will also catch big fish too, use the line release pads. Or pull in the little fish from as far as 200-300 feet. Bammo! Fish On! includes "The RC Fishing Pole", and batteries, everything!